This tutorial will guide you on how to implement an OAuth 2.0 Authorization Server using OWIN OAuth middleware. This is an advanced tutorial that only outlines the steps to create an OWIN OAuth 2.0 Authorization Server. This is not a step by step tutorial. Download the sample code. This outline should not be intended to be used for creating a secure production app. This tutorial is intended to provide only an outline on how to implement an OAuth 2.0 Authorization Server using OWIN OAuth middleware. If you have questions that are not directly related to the tutorial, you can post them at Katana Project on GitHub. For questions and comments regarding the tutorial itself, see the comments section at the bottom of the page. The OAuth 2.0 framework enables a third-party app to obtain limited access to an HTTP service. Instead of using the resource owner's credentials to access a protected resource, the client obtains an access token (which is a string denoting a specific scope, lifetime, and other access attributes). Access tokens are issued to third-party clients by an authorization server with the approval of the resource owner. Creating a resource server which is protected by an access token. Visual Studio 2017 as indicated in Software Versions at the top of the page. Familiarity with OWIN. See Getting Started with the Katana Project and What's new in OWIN and Katana. Familiarity with OAuth terminology, including Roles, Protocol Flow, and Authorization Grant. OAuth 2.0 introduction provides a good introduction. Add an OWIN Startup class under the project root folder named Startup. Create an App_Start folder. Select the App_Start folder and use Shift+Alt+A to add the downloaded version of the AuthorizationServer\App_Start\Startup.Auth.cs file. // Enable the Application Sign In Cookie. // Enable the External Sign In Cookie. // Authorization code provider which creates and receives the authorization code. // Refresh token provider which creates and receives refresh token. The code above enables application/external sign in cookies and Google authentication, which are used by authorization server itself to manage accounts. AuthorizeEndpointPath: The request path where client applications will redirect the user-agent in order to obtain the users consent to issue a token or code. It must begin with a leading slash, for example, "/Authorize". TokenEndpointPath: The request path client applications directly communicate to obtain the access token. It must begin with a leading slash, like "/Token". If the client is issued a client_secret, it must be provided to this endpoint. ApplicationCanDisplayErrors: Set to true if the web application wants to generate a custom error page for the client validation errors on /Authorize endpoint. This is only needed for cases where the browser is not redirected back to the client application, for example, when the client_id or redirect_uri are incorrect. The /Authorize endpoint should expect to see the "oauth.Error", "oauth.ErrorDescription", and "oauth.ErrorUri" properties are added to the OWIN environment. If not true, the authorization server will return a default error page with the error details. AllowInsecureHttp: True to allow authorize and token requests to arrive on HTTP URI addresses, and to allow incoming redirect_uri authorize request parameters to have HTTP URI addresses. Security - This is for development only. Provider: The object provided by the application to process events raised by the Authorization Server middleware. The application may implement the interface fully, or it may create an instance of OAuthAuthorizationServerProvider and assign delegates necessary for the OAuth flows this server supports. AuthorizationCodeProvider: Produces a single-use authorization code to return to the client application. For the OAuth server to be secure the application MUST provide an instance for AuthorizationCodeProvider where the token produced by the OnCreate/OnCreateAsync event is considered valid for only one call to OnReceive/OnReceiveAsync. RefreshTokenProvider: Produces a refresh token which may be used to produce a new access token when needed. If not provided the authorization server will not return refresh tokens from the /Token endpoint. ValidateClientRedirectUri is used to validate the client with its registered redirect URL. 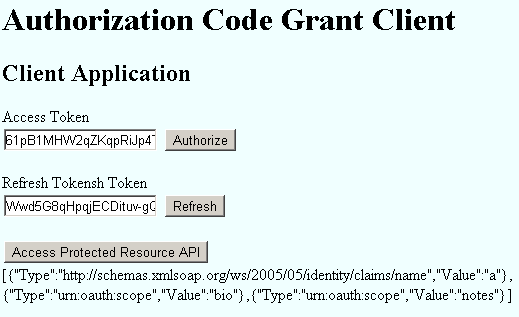 ValidateClientAuthentication checks the basic scheme header and form body to get the client's credentials. Review the IETF's OAuth 2 Authorization Code Grant section now. Provider (in the table below) is OAuthAuthorizationServerOptions.Provider, which is of type OAuthAuthorizationServerProvider, which contains all OAuth server events. A sample implementation for AuthorizationCodeProvider.CreateAsync and ReceiveAsync to control the creation and validation of authorization code is shown below. 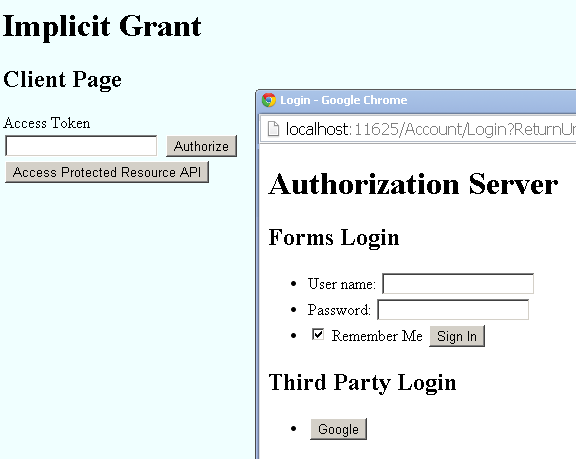 If the Grant button is selected, the Authorize action will create a new "Bearer" identity and sign in with it. It will trigger the authorization server to generate a bearer token and send it back to the client with JSON payload. Refer to the IETF's OAuth 2 Implicit Grant section now. The Implicit Grant flow shown in Figure 4 is the flow and mapping which the OWIN OAuth middleware follows. (D) The client requests an access token from the authorization server's token endpoint by including the authorization code received in the previous step. 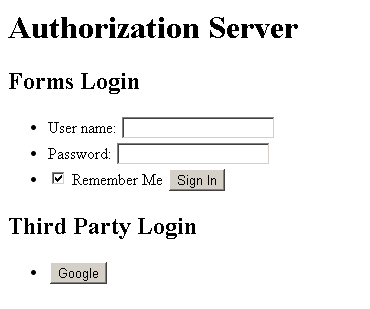 When making the request, the client authenticates with the authorization server. The client includes the redirection URI used to obtain the authorization code for verification. Since we already implemented the authorization endpoint (OAuthController.Authorize action) for authorization code grant, it automatically enables implicit flow as well. Note: Provider.ValidateClientRedirectUri is used to validate the client ID with its redirection URL, which protects the implicit grant flow from sending the access token to malicious clients (Man-in-the-middle attack). Refer to the IETF's OAuth 2 Resource Owner Password Credentials Grant section now. The Resource Owner Password Credentials Grant flow shown in Figure 5 is the flow and mapping which the OWIN OAuth middleware follows. (A) The resource owner provides the client with its username and password. (C) The authorization server authenticates the client and validates the resource owner credentials, and if valid, issues an access token. The code above is intended to explain this section of the tutorial and should not be used in secure or production apps. It does not check the resource owners credentials. It assumes every credential is valid and creates a new identity for it. The new identity will be used to generate the access token and refresh token. Please replace the code with your own secure account management code. Refer to the IETF's OAuth 2 Client Credentials Grant section now. The Client Credentials Grant flow shown in Figure 6 is the flow and mapping which the OWIN OAuth middleware follows. (B) The authorization server authenticates the client, and if valid, issues an access token. The code above is intended to explain this section of the tutorial and should not be used in secure or production apps. Please replace the code with your own secure client management code. Refer to the IETF's OAuth 2 Refresh Token section now. The Refresh Token flow shown in Figure 2 is the flow and mapping which the OWIN OAuth middleware follows. (H) The authorization server authenticates the client and validates the refresh token, and if valid, issues a new access token (and, optionally, a new refresh token). Create a startup class and configure authentication and Web API. See AuthorizationServer\ResourceServer\Startup.cs in the sample download. See AuthorizationServer\ResourceServer\App_Start\Startup.Auth.cs in the sample download. 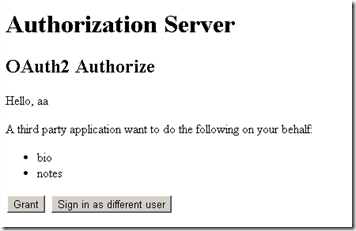 See AuthorizationServer\ResourceServer\App_Start\Startup.WebApi.cs in the sample download. UseCors method allows CORS for all domains. UseOAuthBearerAuthentication method enables OAuth bearer token authentication middleware which will receive and validate bearer token from authorization header in the request. Config.SuppressDefaultHostAuthentication suppresses default host authenticated principal from the app, therefore all requests will be anonymous after this call. HostAuthenticationFilter enables authentication just for the specified authentication type. In this case, it's bearer authentication type. In order to demonstrate the authenticated identity, we create an ApiController to output current user's claims. If the authorization server and the resource server are not on the same computer, the OAuth middleware will use the different machine keys to encrypt and decrypt bearer access token. In order to share the same private key between both projects, we add the same machinekey setting in both web.config files. <machineKey decryptionKey="Enter decryption Key here"
We use the DotNetOpenAuth.OAuth2.Client NuGet package to simplify the client code. The Authorize button will redirect browser to the authorization server to notify the resource owner to grant access to this client. The Refresh button will get a new access token and refresh token using the current refresh token. The Access Protected Resource API button will call the resource server to get current user's claims data and show them on the page. Here is the sample code of the HomeController of the client. Security - Never disable SSL in a production app. Your login credentials are now being sent in clear-text across the wire. The code above is just for local sample debugging and exploration. Open a new window and redirect to the authorize endpoint of the Authorization Server. Get the access token from URL fragments when it redirects back.